AirTrans Rewards Credit Card Review: Is It an A+? 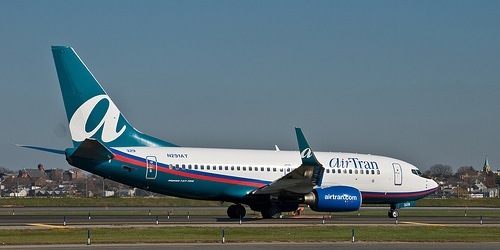 If you didn’t already know the name AirTran, it’s a national airliner that was recently scooped up by rival Southwest. Despite the merger, the pair still operate separately to some extent, with their own websites, their own planes, and now, their own credit cards. But the beauty of the AirTran credit card is that its rewards can be used for flights on both AirTran and Southwest airlines. Let’s dive into the details to learn more about this new offer. As mentioned, and as the name implies, we’re looking at a rewards credit card here. More specifically, travel rewards. For every dollar spent using the card, you earn one A+ Rewards Dollar. That number is doubled for purchases on all AirTran Airways and Southwest Airlines purchases made directly with the companies. You can also earn double dollars when you use the card for purchases at A+ Rewards and Rapid Rewards® Hotel and Rental Car Partners. And members of Rapid Rewards (Southwest Airlines) and A+ Rewards (AirTran Airways) can transfer their rewards between the two frequent flyer programs. Aside from the standard reward dollars earned, new cardmembers are also eligible to receive 16 A+ Rewards credits, assuming they spend a minimum of $1,000 within the first three months from account opening. That’s enough for a free roundtrip flight. You also get an additional two (2) credits every year on your cardmember anniversary. Lastly, you will receive two AirTran Airways Business Class upgrades after your first purchase. So basically you can fly roundtrip in style, as each upgrade only takes you one way. It’s pretty simple. 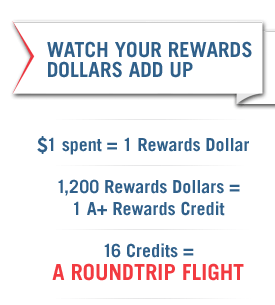 For every $1,200 in A+ Rewards Dollars earned, you’ll get one “credit” toward your next flight. And once you accumulate 16 credits within any 24-month period, AirTran Airways will issue a roundtrip flight voucher. Note: It’s unclear if they expire if not earned during that two-year window. Alright, let’s do a little math to see how easy it is to earn rewards. So if you were only using the card on a one-to-one basis for normal purchases, you’d get a free roundtrip flight for every $19,200 spent. If you use the card exclusively for Southwest and AirTran flights, that’s a free flight for every $9,600 spent. But wait. Assuming you factor in the two free credits you get annually, it drops to $16,800 and $7,200, respectively. In other words, it’s not that difficult to earn a free flight with this card, especially if you travel on AirTran and Southwest fairly often. For the record, the pair fly to over 90 destinations worldwide. And by worldwide, they mean the USA, Mexico, and the Caribbean. A few more important details; the credit card APR for both purchases and balance transfers is a variable 15.24%, which is in line with the norm. So it’s not a great credit card for balance transfers, or wise to carry a balance for that matter. Only good for spending and paying off in full. Additionally, there is a $69 annual fee, so unless you’re actively using the card and like to travel on AirTran/Southwest, it might not make sense. Tip: There is also an AirTran Airways A+ Rewards® Business Card for those with a small business that are looking for similar rewards. All the details appear to be the same. In summary, I wouldn’t call this credit card an A+, largely because of the annual fee and the lack of destinations available on the two carriers. Additionally, flights on these carriers are already pretty cheap, so the free flights might not be worth as much. But it could be a winner for someone who travels frequently on a domestic basis on these carriers, and pays their credit card off in full, as it’ll be pretty easy to earn free flights. Why not just get the Southwest credit card instead. It offers better rewards in my opinion and you can use the rewards for Air Trans and Southwest. Previous Previous post: Introducing the Google Credit Card: Say What?